As part of the June 6, 1944 Normandy landings, the USS LST-510 (landing ship for tanks) delivered 200 GIs, and 70 tanks and jeeps to Omaha Beach. She then anchored offshore to serve as an impromptu hospital ship for the over 150,000 Allied wounded. For three months following the invasion, she ferried injured soldiers back to England and supplies back to the front, evading German U-boats and dive bombers. She was awarded a Battle Star for her meritorious participation. Thought to be the last D-Day ship still in active service, the renamed M/V Cape Henlopen now plays a more peaceful maritime role: she transports passengers and autos across picturesque Block Island Sound. Recently, owner Cross Sound Ferry repowered the 328' x 50' historic vessel with a pair of 2,130 hp CAT engines, and state-of-the-art Twin Disc transmissions and control systems. Thames Shipyard & Repair of New London, Conn., installed the CAT 3516C IMO II engines. It paired these to Twin Disc's legendary MGX-5600 QuickShift transmissions and four helm station EC300 Power Commander electronic controls supplied by Mentor, Ohio-based Great Lakes Power Products. The combination delivers seamless, instant torque, from neutral to full ahead, without the hesitation and clunking common with traditional marine transmissions. This immediate response is especially important when maneuvering within a crowded seaway or the tight confines of a ferry terminal. 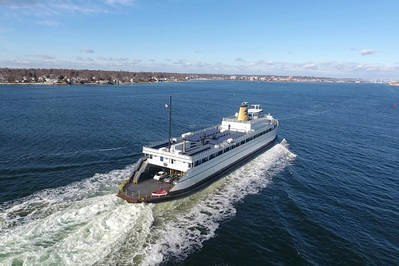 Cross Sound Ferry Services, Inc. operates a fleet of nine ferries between its headquarters in New London, Conn., and Orient, N.Y., across Block Island Sound.